Oregon's Rogue River, one of the country's first designated Wild and Scenic Rivers. This week marked the 50th anniversary of the passage of the Wild & Scenic Rivers Act. Passed by President Lyndon Baines Johnson in 1968, the Act was created “to preserve certain rivers with outstanding natural, cultural, and recreational values in a free-flowing condition for the enjoyment of present and future generations.” Since its passage, the Act has protected almost 13,000 stream miles on more than 200 rivers across the United States. Anglers know better than most the importance of cold, clean water, adequate flows, and intact watershed function for the health and viability of salmon, trout, and steelhead populations. The Wild and Scenic Rivers Act considers and permanently protects all such “outstandingly remarkable values” of qualifying rivers. In fact, many of our most iconic fisheries are in the state they’re in today because of the Wild and Scenic Rivers Act – amazing fisheries such as the Skagit, North Umpqua, Chetco, and Klamath rivers all have benefited from the protections conveyed by the Wild & Scenic Rivers Act. 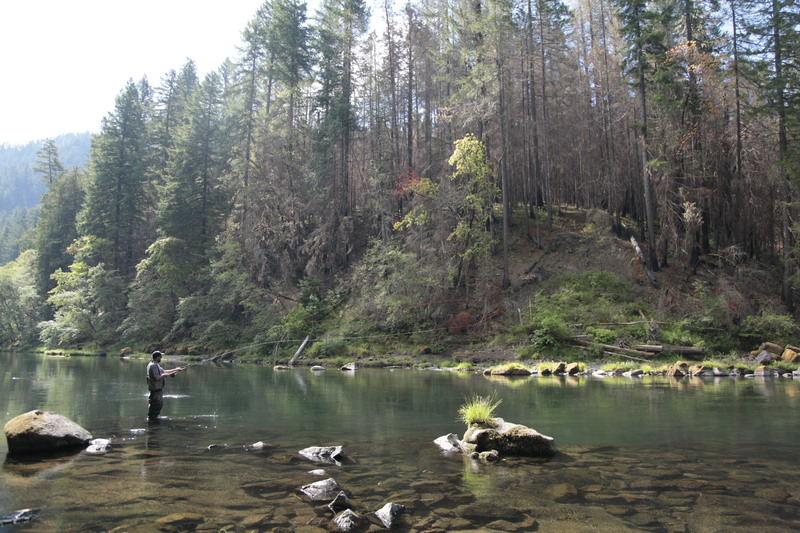 An angler casts for summer steelhead on the Wild and Scenic North Umpqua River. Protecting intact habitat is the Holy Grail of coldwater fisheries conservation. Many more miles of important trout, salmon and steelhead streams across the U.S. merit Wild and Scenic Rivers designation, and TU is leading efforts to gain this status for such streams as the Chetco, Elk, and Molalla through the Oregon Wildlands Act (which passed out of Senate Committee markup today!). To commemorate the 50th anniversary of the Wild & Scenic Rivers Act, filmmaker Shane Anderson and Pacific Rivers, with support from Trout Unlimited and other groups, created a short film entitled “Run Wild, Run Free” which gives a historical perspective on why the Act was passed into law and what it’s accomplished in its brief history. Shane has made the film available for just three days (!!!) on Vimeo to help celebrate the 50th anniversary of the act. After October 4, folks will have to find the film in festival shows or purchase a copy. Click on over to Shane’s Vimeo page or watch below and take 45 minutes to help us celebrate the iconic Wild and Scenic Rivers Act and all the marvelous river miles it’s protected! Run Wild Run Free: 50 years of Wild and Scenic Rivers : FULL FILM from Pacific Rivers on Vimeo.